Forests are very beneficial for humans being, among others, to prevent from erosion and landslides. The roots of the tree serves as a binder grains of soil. With existing forest, the rain water do not fall to the land surface but fall to the leaf surface or absorbed to the soil . to preserve, regulate, and maintain supplies and balance water in the rainy season and dry season. Fertilize the soil as the leaves that fall would break down into top soil. As an economic resource, the forest can be used as a result of raw material or raw materials for industrial or building materials. For example, rattan, rubber, and latex are used for crafts and building materials industry. As a source of germplasm diversity in forest ecosystems allow for the development of genetic biodiversity. Reduce pollution to air pollution. Plants are able to absorb carbon dioxide and produce oxygen needed by living things. Kalimantan Forest is a crucial for Indonesia. Kalimantan forest is a tropical rain forest which is rich in species diversity and wildlife. Kalimantan forest is a forest that produce the oxygen that is very large and absorbing carbon dioxide from various anthropogenic emissions. Viewed from the economy aspect, it is very important for Indonesia because it generates a lot of wood and non- wood products. Of timber products from Kalimantan forest there are many products like Meranti (Shorea sp. ), Ulin (Eusideroxylon zwageri), Keruing (Dipterocarpus sp. ), Sandalwood (Santalum album), Ebony (Diospyros celebica), Sonikeling (Dalbergia latifolia), Teak ( Tectona grandis), etc. These woods are very good for the furniture industry, home -making, craft materials, etc. Of Non-wood products there are many products produced from Kalimantan forest, Such as oily oil eucalyptus oil, patchouli oil, etc. Gum resin products such as, copal, rosin, kemenyan, jernang, and rubber latex such as: jelutung, perca, hangkang, ketiau, etc. . Extract products such as dyes, tanning materials, and alkaloids . In addition, there are products like medicinal plants, mushrooms, swallow nest, various tubers, various fruits, grasses, charcoal dam. All wood and non- wood products can be produced in the Kalimantan forest. it From the results of these products, these could increase the economic prosperity of the community and increase foreign exchange for Indonesia and increase jobs for the people of Indonesia. View from climatological, Kalimantan Forests plays an important role for the oxygen supply in Indonesia since the Kalimantan Forests has ± 40 million hectares of forest. With a large Kalimantan forest it can supply 200-300 tonnes of oxygen per 200 thousand hectares of forest land. Therefore Kalimantan is very important role in the absorption of carbon dioxide. it can not imagine that amount of carbon dioxide that can be absorbed by the entire forest in Indonesia. Kalimantan forest also regulates a climate because it can reduce a global warming. If the Kalimantan Forest is preserved it will reduce global warming. The function of Kalimantan Forest serves for Forest Ecosystem in Indonesia which can be viewed from three different aspects, namely the tree stand, soil and landscape land . Of tree components, the forest generally consumes water that is higher than the other vegetation, because of the trees in the forest have a high rate of transpiration. Additionally forest canopy hold most rainfall and then vaporize back into the air before reaching the soil surface (forest floor). Trees provide the best possibilities for the improvement of soil properties. The tree produces a fairly high litter can increase the thickness of the litter and organic matter content of the forest floor. Thus, the forest floor has infiltration capacity which is much higher than non-forest land cover. The thick litter layer also increases the biological activity of the soil in overhauling the dead tree roots. Timberland has many pores, large pores, even pipe - soil pipe weathering former roots, so the forest soil has a percolation rate of water (water movement) high. Thick litter and small plants under the trees also provide land cover is double that forests has capability to control erosion and runoff. The tree cover is being offset by the creation of litter and undergrowth can actually increase the spur erosion, because the kinetic energy raindrops from trees more than 7 feet tall can be greater than the energy droplets of rain that falls freely without going through the plant canopy. Water droplets canopy regain its kinetic energy by 90 % of the initial kinetic energy when the water falls directly on the crown with a height of 7 feet or more. In addition, grains of water suspended in collected each leaf will form larger droplets, thereby actually increasing the total power at the soil surface droplets. Beads of water from the leaves that fall below the tree covered litter and undergrowth, causing greater erosion than grains of rain that falls freely. Thus, extraction of forest litter or destruction of vegetation under a negative impact on forest functions as controlling erosion and runoff. Kalimantan forest is beneficial for the world. 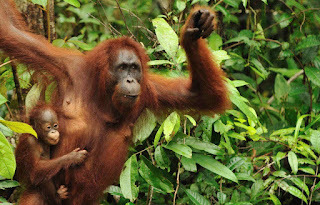 the forest in Kalimantan Island is one of the world's lungs buffer. Therefore, continuity must be maintained and kept aside buffer lungs of the world, the forests in Kalimantan has a role to maintain the natural balance of the islands which oversees four provinces was spared from the disaster. the possible disasters may come in the form such as flooding because of illegal logging. In addition, the number of pollution in the world cause the greenhouse effect which is very dangerous for the state of mankind, where the depletion of the ozone layer in the sun's atmosphere make the incoming radiation to the surface of the world is causing rising temperatures that lead to the melting of the mountains at the south pole and the north pole. This adds to the height of water on the earth's surface increases. Increasing the temperature of the earth to make the states, that are adjacent to the sea to worry because it will cause an increase in water area. And if this continues will cause sinking of the plains, which will destroy existing civilization. First, start from yourself. For example, care the matter of life and future of our environment better by always seeking out the latest developments of climate change from a variety of sources of information. Spread the word and transmitted to people anywhere and anytime. Second, do the electrical energy saving. In this case, home lighting usually results in 5-10 % of total household carbon footprint. Most of the electronic equipment in the home such as televisions, refrigerators, air conditioners, vacuum cleaners, ovens, irons, washing machines, and computers absorb large amounts of electricity. When we do these thing, it will impact the cost savings. Third, recycle waste. But, now we have to think further because if littering continuously without further process or recycling, the environment will be polluted. Perform waste sorting organic and nonorganic. Organic ( like the rest of the fruit, vegetables and natural foods ) can be used as compost, whereas the non-organic ( such as plastic, paper, copper ) can be recycled to be used as other products. Do not burn trash because it can generate gases which can cause pollution of soil and air. If you get bored with the old stuff can be sold. Fourth, do it wisely saving fuel and using transportation . Based on data from the WWF, the transportation sector accounted for 27 % of emissions of CO2 (carbon dioxide) from burning fossil fuels. So, try to do, among other things, set out to work together with all the family members or friends who have a direct purpose. It all transportation cost efficiency. Do check carbon emissions from private vehicle routine. When possible use of mass transportation such as rail, bus or other public transport, and use a bike or walk to a nearby place . Fifth, saving water. According to WHO, decent human uses of water 2.5 % of all water on earth. The rest, 97.5 percent, is the sea water. While that can be consumed by humans only 1 % from 2.5 %. So the conclusion for Indonesia and the World, Kalimantan Forest play an important role in human life and the sustainability of ecosystems. Humans and Forests interact and need each other, but humans need more forest than the forest of human need. Forests have many benefits such as Economics, Climatology, and Ecosystems. However, humans do not appreciate the forest by forest destruction. In order to keep the natural forest as human beings then we must be wise in the use of the forest by way concerned with forests, saving electricity, recycling rubbish, save fuel, and conserve water. That way, it will not be damaged forests and the world will be safe .